One would think that after having been on the road or air or water for the better part of 10 months we would be travel-planning veterans. Experts that could, within minutes, successfully book transportation, accommodation and activities to just about anywhere. That I am afraid is not the case. Even with multiple days to plan our Vietnam part of this trip we goofed up. We kind of started off on the wrong foot with Vietnam. While we were aware, in the back of our minds, that the process to obtain a visa for Vietnam was a bit more complicated than any of the other countries we have previously visited, we really didn’t spend any amount of time researching this topic until we we were in Cambodia (Mistake #1). Turns out that they have companies that will do a lot of the upfront visa legwork for you. Essentially getting you on a list and providing a letter that says you are OK to receive your visa at the airport. We sort of assumed this would take a day. It doesn’t. The basic packages (for $10/person) allow for 5 business days – so no Saturdays & Sundays. We arrived in Cambodia of course on a Friday afternoon and didn’t really start looking into this until Saturday. (Mistake #2). We ended up paying just a few dollars extra for an expedited service but had to extend our stay in Siem Reap while we waited for the service to do their thing. 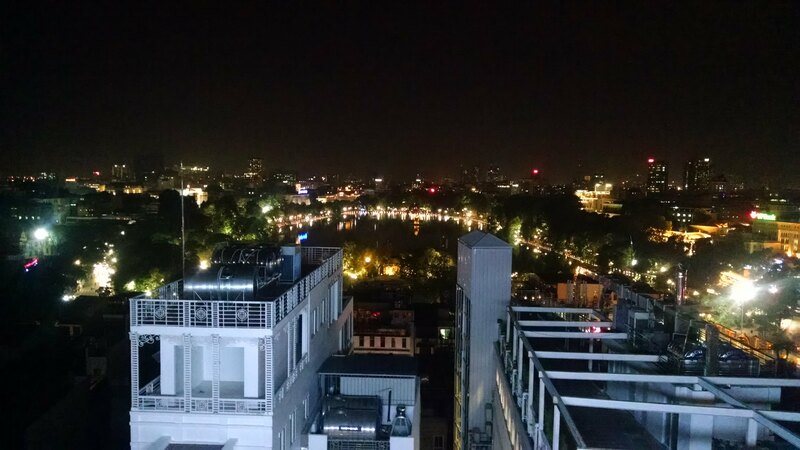 Enjoying a cocktail over-looking Hoan Kiem Lake in the Old Quarter of Hanoi. Such a dramatically different perspective vs the dirty, crowded and hectic streets below. Staying in Cambodia, especially Siem Reap, while not ideal is also not the worse thing in the world. Chalk it up to poor planning. Now let’s go ahead and rock n roll in Vietnam. 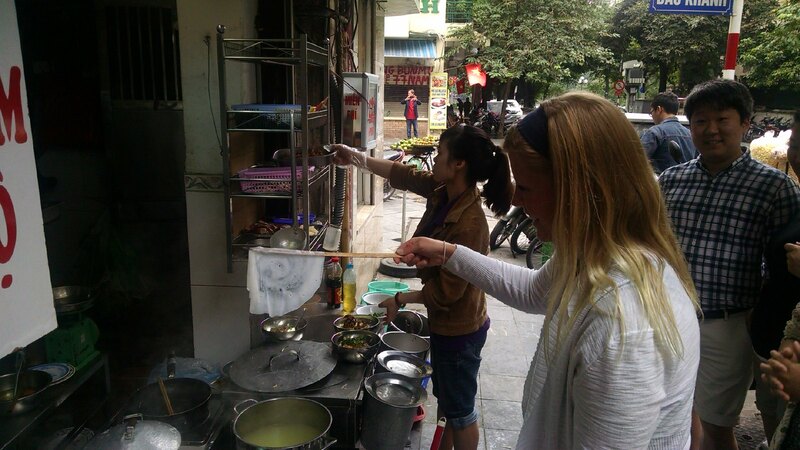 Lindsay – you take care of booking our Halong Bay trip. 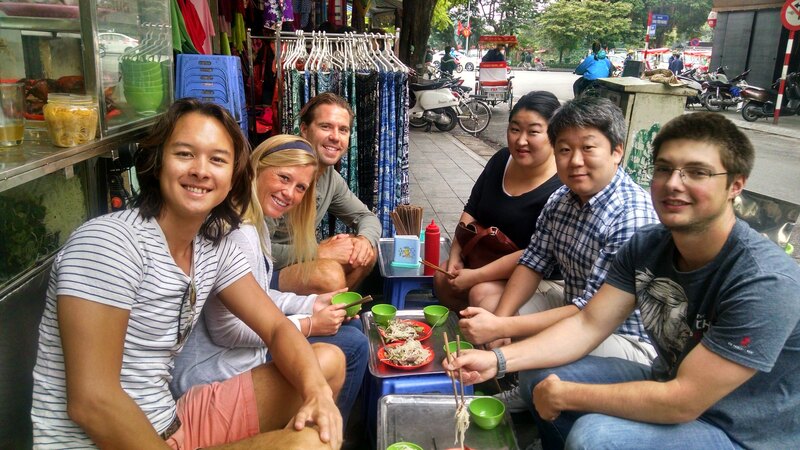 I will develop and book our 3 day itinerary for Hanoi. This is going to be epic. we’re going to have a blast. Day 1: arrive via plane in evening, cab to hotel. Check in, eat dinner. Day 3: Check out some of the sights and sounds of Hanoi – particularly their Water Pupper Theatre, take a jog around the lake just a few minutes from our hotel. Enjoy high tea at the Sofitel in the Old Quarter. Get a massage. Day 4: Road trip to Halong Bay. Tour the bay, stay on boat for the evening. 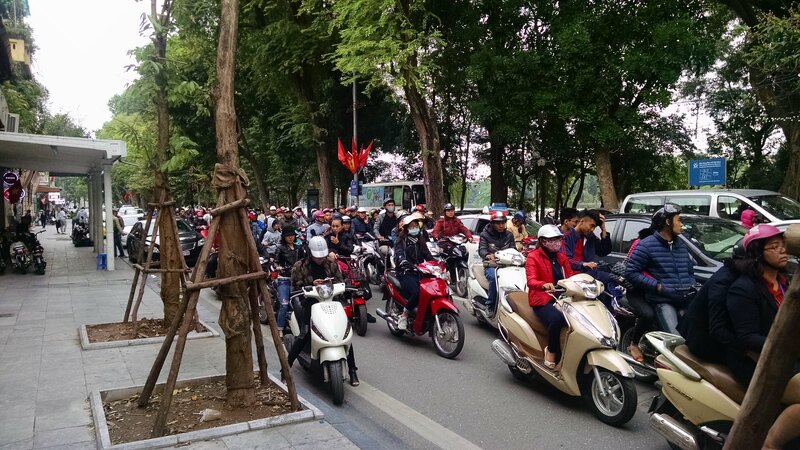 Day 5: Wake up, a few more activities on the bay, drive back to Hanoi. Stay at airport hotel. Day 6: Fly to Hong Kong in AM. We were really excited about this “solid” plan. It was a healthy mixture of planned activities and free time to enjoy the (I am not kidding) $.20 draft beers and eat as much pho and bahn mi as we could possibly want. However – it turns out we just weren’t on the same wave lengths. You see, Lindsay was in charge of booking our flights and our Halong Bay excursion. I was in charge of booking the hotels for the days we’d need them and planning all the city of Hanoi stuff. That type of plan takes an extraordinary amount of good luck and tight, concise communication to pull off. I guess we didn’t have much of either going for us. In the car ride from the Hanoi airport to our hotel on the first night I had this weird feeling that we had fudged up our dates. A quick look at some of the flights, dates of Halong Bay and hotel dates confirmed that we had booked everything like a couple of baboons. Our flights gave us 4 nights in Vietnam, our hotels would have us there for for 5 nights. Something has to give. 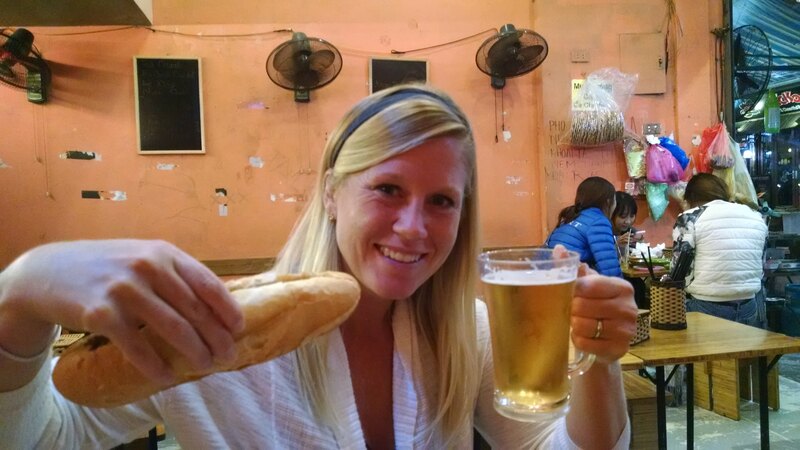 Let’s be honest – regardless of how bad you plan your travel a $1 fresh bahn mi sandwich and a $.25 beer cures all. Also: Look at the size of Lindsay’s hands! It’s like movie magic! Note: This actually became our Thanksgiving dinner. We decided to opt-out of the traditional style and eat like a local, great decision and much cheaper! Thankfully we found an opportunity when the hotel we booked with to stay in Hanoi for 3 nights couldn’t find our reservation and had to move us to a new hotel. We took advantage and altered our stay to 2 nights, cut out some of the silly stuff like high tea time at the Sofitel and left the remainder of itinerary (Halong Bay, hotel near airport, food tour, etc…) untouched. It turns out that this was really a welcome mishap. Makes for expensive trips to countries when you have to pay visa, flights and hotels for just 4 nights – but in the end it all worked out. For me, this was definitely the highlight of Hanoi. I love pho – the Vietnamese noodle-soup served in a beef broth with thin slices of different cuts of beef. Bahn mi is becoming really popular as well. Right before we left a bahn mi shop opened near our apartment in Wicker Park that was serving delicious sandwiches. I couldn’t wait to get the real deal. For $20 we got a guided tour by a very good English-speaking guide, 7 different tastings of traditional Vietnamese food (although this did not include pho which was surprising) and we were accompanied by 4 there people – bringing the total group size to 6 plus the guide. 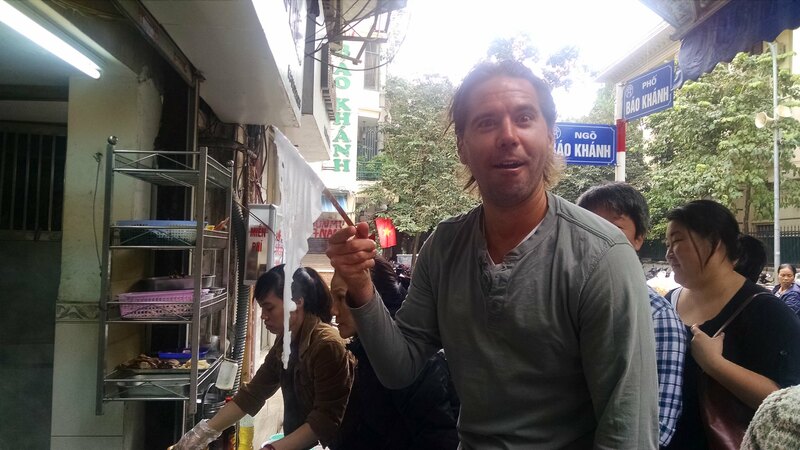 The first stop was at a little stand serving on bún riêu cua for the last 35 years. Only one single dish. Crazy. It’s a crab (sausage) soup. Not something I would have looked for on the crazy streets of Hanoi but it was really good. 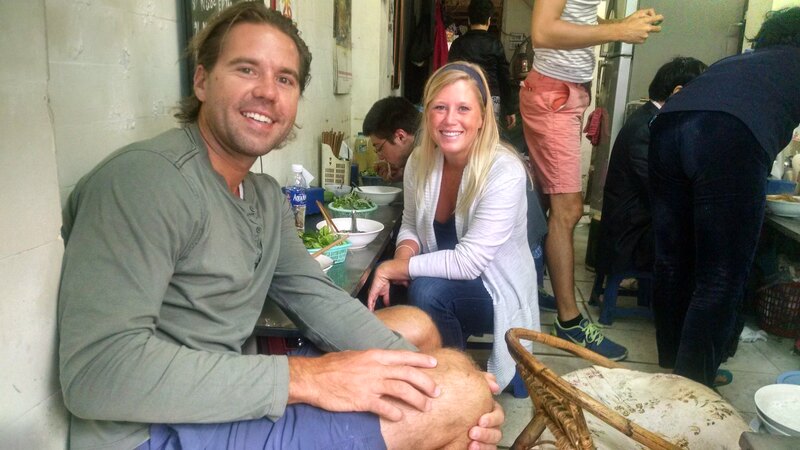 The weather was a little cold in Hanoi (it’s their winter) so Lindsay and I are dressed appropriately. 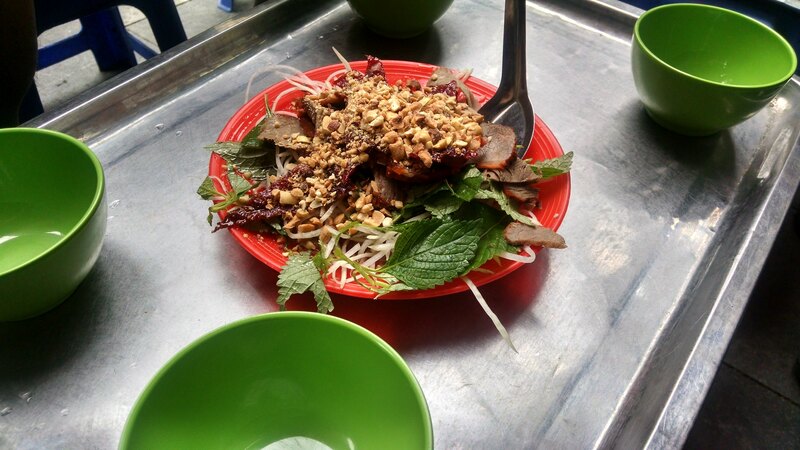 This dish called nôm bò is a green (unripened) papaya salad served with the Vietnamese version of beef jerky. None of the places we visited really had menus or any English translations, so the odds of us trying any of them were slim. This was one of our favorites. So much going on with this dish – all for the grand total price of $1 per plate. Not bad. The group stopped at a “pancake” making station to watch in amazement as the lady whipped out one after another after another. She was working 2 griddles, alternating between the two of them to produce 20 of these pancakes. 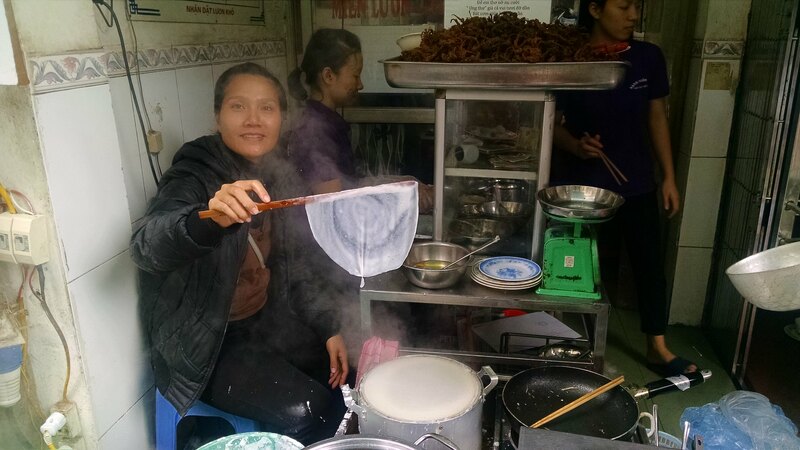 The batter, made with rice flour, is poured onto a silk screen that is set on top of a boiling pot of water. She then would cover the batter with a lid and within 5 or so seconds peel the pancake off with a small wooden stick and hand it to her associate behind her who would fill the pancakes with whatever the customer ordered (usually some type of minced meat) and then another would deliver. They did this non-stop for the 10 minutes we were there. it was pretty brilliant. Lindsay tried her skills at plucking a pancake from the silk screen and did a darn good job. I, unfortunately, would have been fired on the spot. Not a food stop – but this old, European-style church was pretty cool. 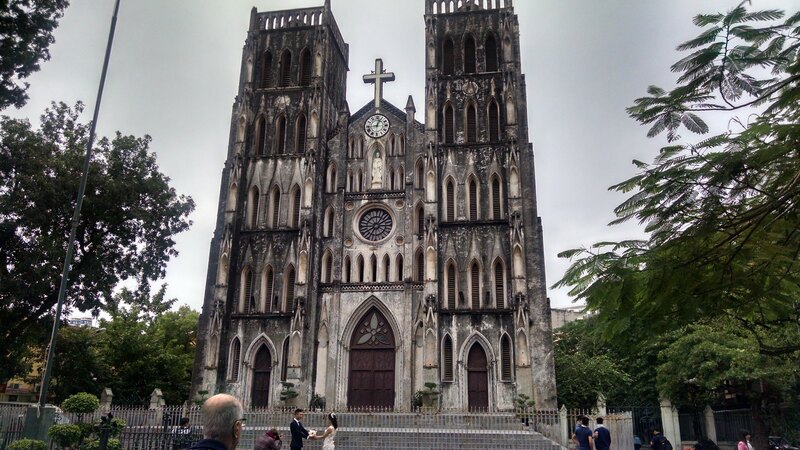 I read quite about about how Hanoi’s Old Quarter is loaded with European influence in the buildings. I even read that Hanoi is the Paris of Asia. I have to tell you, after having been to Paris and some parts of Europe this really is misleading. It would be like calling Des Plaines, IL the Las Vegas of Midwest because we have a casino there. Regardless this church was pretty cool, but unfortunately we did not go inside. 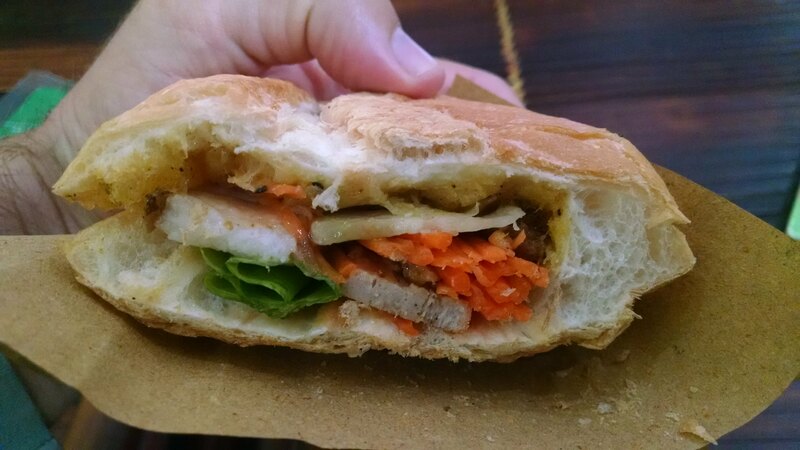 The bahn mi was excellent. Fresh baked delicious French bread. (which reminds me to write I don’t know why the U.S., in general, can’t make awesome bread all the time everywhere. The breads of other countries consistently blow whatever we’re making out of the water.) Sad to say that we went back to this place because we liked their sandwiches so much a couple days later and the sandwiches were old and simply reheated. Kind of ruined the “magical” experience we had on the walking tour. Oh well. Vietnam ranks very high on many backpackers list of places to visit because it’s consistently rated by sites like Priceoftravel.com as one of the cheapest in the world. The most significant influencers of their price indexes are the costs of: accommodation, food and beer. 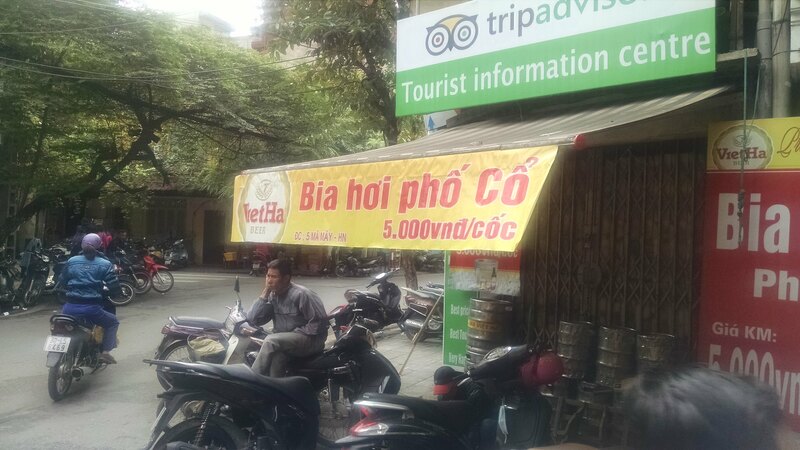 In Hanoi you can get a draft of “Bia Hoi” or fresh beer for 5,000 Vietnamese Dong (and yes, that is the official name of the currency). At current exchange rates that amounts to twenty two pennies for a cold draft beer on the streets of Hanoi. Yeah baby!! All good things must come to an end. After trying what was probably my favorite dish of the trip – a bbq pork soup called bun cha – we had a little dessert of unflavored yogurt and black sticky rice (actually very, very good). We decided to go with an 11am lunch tour which meant we had some time to burn. 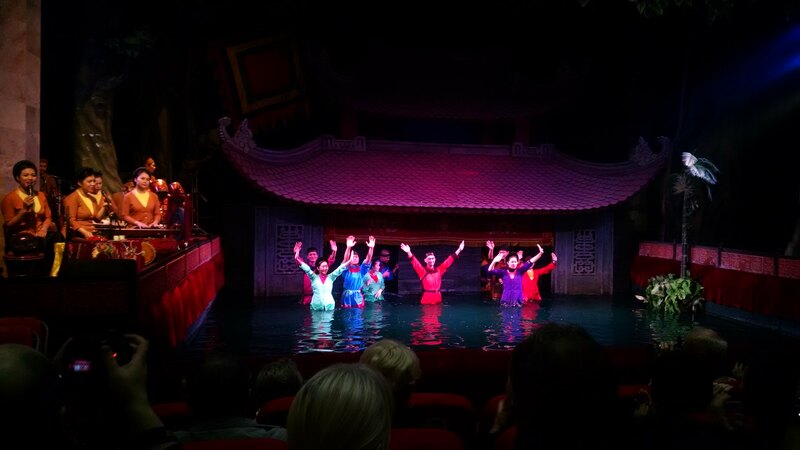 The group decided to check out the famous Thang Long Water Puppet theatre. For $5/person you get the best seats in the house and an hours worth of entertainment and live music. The show is entirely in Vietnamese so there was plenty of moments where Lindsay and I had zero clue what was going on. Overall though you can’t beat that type of live entertainment for $5 a person. And if you’re really on a budget seats towards the back (of the very small theatre) are only $3 a person. The performers thanking the audience for the well-deserved applause at the conclusion of the show. Theaters operate differently in Vietnam compared to their American counterparts. There was a gentleman sitting right in front of us taking full-color video of the entire show while talking on his cell phone. This seemed very much acceptable. This traffic went on for well over a block – and this wasn’t the worse we saw. But even with following the rules and looking out for traffic you cannot always avoid an accident. I learned the hard way trying to cross a 6-lane (one way mind you) street to get to the theatre. It’s impossible to describe with words (for me at least) what this looks like. Traffic was flowing from my right to left. I watched carefully and saw a good break to get my start. I began walking – at a good pace. Consistent. Confident. Keeping my eyes and head to the right to make sure there wasn’t anything coming I didn’t notice at first. And then BAM!! “What the F**CK! !” My leg is killing me. I am startled. I turn around and there is a girl (swear) on a motorbike that just crashed into me driving the wrong way on a 6-lane road. She looked at me. Didn’t say a word. And just continued driving the wrong way. My leg hurt for the rest of the day and ended up being scratched and bruised. Traffic signs, traffic markings in the road, traffic lights, generally accepted rules of the road — all of those things — are thrown out the window. It’s a genuine free for all on the road. It’s cool until you get hit. ← What do tarantulas and dogs have in common?